On the Cosmic Ocean of Vaikuntha, Vishnu lay supine on the coiled bed that was snake Adisesha (Anantha). It was the 950th day after Kaliyuga, and he saw the world falling from grace save for the penance of a Tulu Brahmin, Divakara Muni. 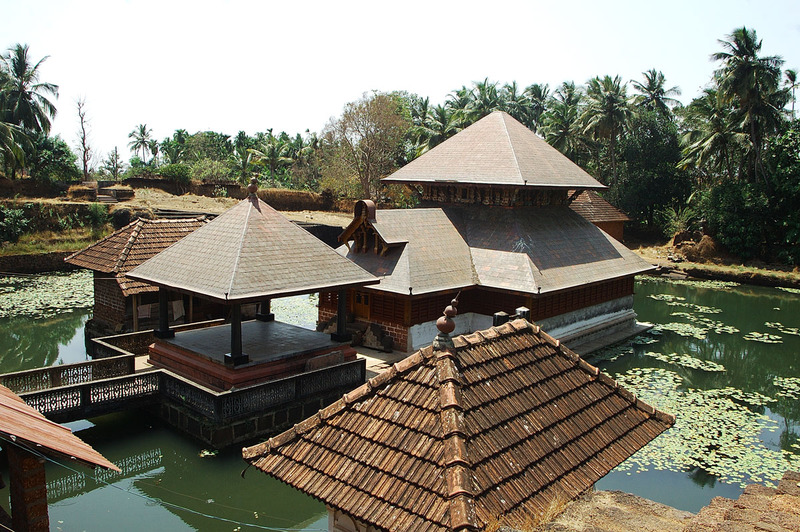 The sage, a devotee of Lord Vishnu, came from Lothal to what is present-day Ananthpura in Northern Kerala. In a quiet corner close to nowhere, he built a rock-cut lake temple dedicated to Ananthapadmanabha Swamy. The placid waters of Vaikuntha stirred with the extreme devotion of Divakara, and the pleased lord appeared before him in the form of a beautiful child. The hermit – awed by the divine child – requested him to stay with him. The child agreed but on the condition that the sage would never scold him. The hermit agreed, and tolerated all his childish pranks. But one day as he meditated, the child took the sacred saligrama stone and put it into his mouth. Horrified at this desecration, the sage admonished the child, who immediately ran away saying he’d be found again only in Anantankadu (the forest of Ananta). A distraught Divakara followed the child to a forest near the seacoast and saw him vanish into a huge ilappa tree. The tree fell to the ground and assumed the shape of a 13 km long reclining image of Maha Vishnu. Divakara prayed that the Lord condense himself, enabling his devotee to see him with his limited vision. Vishnu shrank in size and ordained that henceforth pujas at the Padmanabhaswamy Temple at Trivandrum would be conducted by Tulu Brahmins. And so it remains to this day. While this episode from the Ananthasayana Mahatmya explains how the deity found a new home in Thiruvananthapuram, little is said of its original home. Forgotten in the dusty folds of history, Ananthapura is a tiny speck of sand that escaped the Cosmic Hourglass of Time. Though situated a mere 12 km from the bustle of Kasargod, you won’t find many tourists on the serpentine road to Ananthapura. Nothing to offer except peace, tranquility and a temple precinct littered with legends, this is hardly your average tourist destination. What it does possess is a magnetic draw that can only be ascribed to some unknown divine force. Perhaps the same that magically drew me to it. 2 km off the road to Kumbla, Ananthapura is reached by a wisp of a road that coils around the bare landscape like an unending snake. I thought I had reached one end of the habitable world. Just as I was ready to give up and turn back, a wall appeared to the right. I descended a flight of steps and was beset by a sight no offbeat travel guide could prepare me for. An ancient temple stood in a quiet pool of water, accessible by a thin strip of a corridor. It had been standing like this for over a thousand years now. The occasional splash of fish sent ripples on the water’s surface, piercing the dead quiet that enveloped me. The pundit sensed my awe and smiled. To push me further into the abyss of metaphysical thought, he said “The water represents the unhinged fluid mind of the individual, while the temple at the center symbolizes the steadfast divine spirit.” It took me half a minute to turn from his face to the pool, or maybe it was half an hour. I can’t tell. I was in a time warp, where a moment had come to a standstill and the loudest sound was the beating of my heart. I walked up to the sanctum sanctorum and peered into its dimly lit interiors. As I wondered about the identity of the three statuettes, a voice behind me said, “That’s Anandpadmanabha Swamy in the middle, with the Goddesses Bhoo Devi and Sri Devi on either side.” I turned around to face the pundit, who seemed like he was in charge. “They were added later”, he continued. “In fact, we’re going to change the old statue too, just the way we’ve given the crumbling architecture a face-lift,” he said, gloating over the ugly additions with pride. The pundit had an expression writ over his face that clearly said ‘The Management Has Changed.’ It was apparent that visitors in Ananthapura were rare. Rarer still were bearded bikers looking for episodes from mythology. But I was looking for that trusted old hand, who goes about his business in quiet introspection, irrespective of the restructuring that goes around him. I knew it was him the moment our eyes met. I found him in a little cavity to the left, a prayer on his lips and a smile in his eyes. It was he who told me about the crocodile. They call it Babya. If there’s a reason why, I couldn’t find out and the priests didn’t know. What is known, is that from time immemorial, the temple lake has been home to a crocodile. Actually, many crocodiles. The moment one dies, another appears mysteriously in an act of regenerative intervention. What’s equally baffling is such far inland presence of a crocodile. The priest told me that he feeds it rice balls, though it is by no means the vegetarian it’s made out to be. On occasions, the croc has been seen succumbing to the Kerala temptation of fish and rice, helping itself to the unwary fish in the lake. According to one legend, a group of British surveyors had attempted to capture the crocodile and destroy the temple, but had died soon after under mysterious circumstances. Author: Anurag Mallick. This article appeared in February, 2003 in Deccan Herald (Sunday). A very interesting piece to read!! !